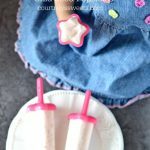 These strawberry chia seed popsicles are healthy and great probiotic for your tummy! In a small bowl combine the orange juice and chia seeds allowing them to soak. In a larger bowl measure out the strawberry smoothie kefir and then add in the oj/chia seed mixture. Pour into ice pop molds and allow to freeze, preferably overnight.